Afternoon tea - in my mind, nothing sounds more delightful... or more British. With endless pots of tea, scones and clotted cream, it is the perfect way to spend a weekend afternoon. And it's exactly what I'll be doing this Sunday! Although traditionally practiced across the pond, the St. Paul Hotel does offer high tea on Saturday and Sunday afternoons. Served in the hotel's elegant lobby, the two hour event offers five courses and delicious tea choices. The courses are small and delicate, serving as a light dinner. I'm so excited! I have to say, I have a thing for high tea. A few years ago, I was lucky enough to have high tea at the Ritz Hotel in London (dream come true). After moving to Minneapolis, I knew I had to find a high tea in the states. Thankfully, the St. Paul Hotel answered my call. I haven't been to a high tea in a few years, and am so excited to go back - this time with my gorgeous mother! Pictures to come. 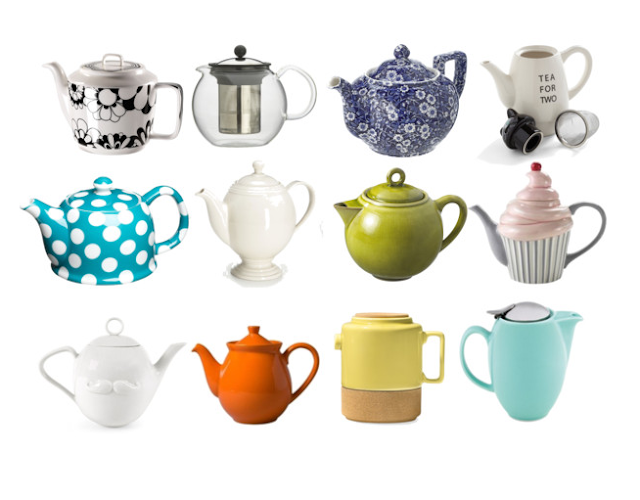 As I'm obsessed with high tea, it's no surprise I'm a fan of teapots. Check out a few of my favorites! I love the second glass teapot! The infuser looks really useful.